With unique '4-wheel drive' foil cutter. Just a quarter turn neatly slices off the foil capsule. Patented cam-action lever maximises torque and swiftly raises the cork. Extra length contoured 'worm' masters natural and synthetic corks with ease. Reviewed and recommended by The Daily Telegraph and The Guardian. 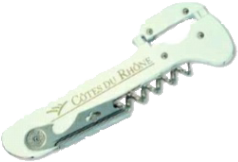 The classic foil cutter Waiter's Friend Corkscrew.